This TGIF will be a great opportunity for new members and ALTS students to get to know all the different aspects of the club. A 'meet and greet' style evening is planned with opportunities to tour and sail on some member boats and have any questions about your new Club answered. How do I get involved with racing? What is this Jemmett's Landing I keep hearing about? Not quite sure of something? This is your event. ALTS students will be introduced to the program, meet your instructors and more. Commodore's Sailpast coming up on June 7th. Brunch extends to all weekend! That's right! Brunch will now be offered on Saturdays as well as the usual Sunday. Weekend Brunch is served 10:30a-3p with the regular menu taking over at 3p-9p. Tickets: $15 at door and $10 in advance. Those 18 and under may attend via a donation. 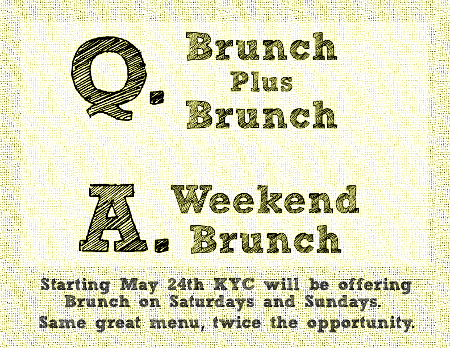 Starting this Saturday, May 24, KYC will be serving brunch from 10:30am until 3:00pm. Saturday Brunch will feature the same delicious breakfast and Lunch menu items as Sunday Brunch, along with daily specials. At 3:00pm, following brunch on both Saturday and Sunday the regular patio menu will be offered for the rest of the day. KYC has also launched its new summer beverage members, featuring old favourites and new options for wine cocktails and beers. As a result of the success of Beau's feBrewery promotion KYC is now carrying some of Beau's seasonal beers by the bottle. The Beaver River I.P.Eh! and Kissmeyer Nordic Pale Ale are currently available, and stay tuned for new selections as they become available. The summer cocktail menu has also been launched, including a new drinks, including the Spirited Vice Commodore, back by popular demand after KYC's Spring Scotch Night. KYC is joining the Ontario Sailing initiative "getintosailing.ca" which will open our doors to the community on June 21.? The Junior Sailing Program is in need of a powerboat to help compliment the coachboat fleet. We are looking for a power boat that is seaworthy and suitable for basic sailing instruction. Boat owners: last chance to book your 2 required (preferred) Race Committee duty slots for the year. After Friday, unfilled time slots will be assigned by the Race Office. If you are interested, or would like more information, please contact Vicki Keith at viki_keith@kingston.ymca.ca or (613) 546-2647 ext 251. "Grow the Podium in Kingston: Can We Do It?" The Kingston Community Foundation presents: "Grow the Podium in Kingston: Can We Do It?" Speaker's Series.